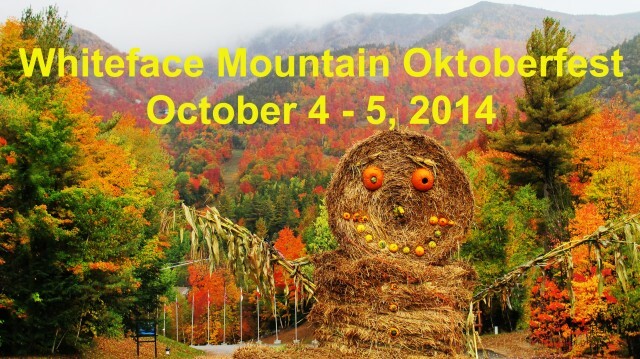 It’s time once again to start planning for Whiteface Mountain’s 22nd Annual Oktoberfest. This year’s festivities take place the weekend of October 4th and 5th beginning at 10am each day. The fun continues until 6pm on Saturday and 5pm on Sunday. There’s a lot in store for attendees again this year. Since the Northern Adirondack area around Wilmington and Lake Placid was nicknamed “America’s Alps” decades ago, it’s only logical that this is the best place in the fall to celebrate Bavarian culture with authentic food and beer as well as music, dancing. There are a host of activities in store for everyone this year, including some big name entertainment. The number one German show band in America these days will be featured at this year's festival - die Schlauberger is a powerful combination of instruments whose reputation is second to none. They’ll have the audience up and dancing from the very first note. Make sure you catch this band’s performances and join in the raucous fun and dancing this year! Another big name in German-American show bands is Spitze. They’ve been featured at many of the largest German-themed events in the US and they’ll provide a show with amazing energy and sound not to be missed. 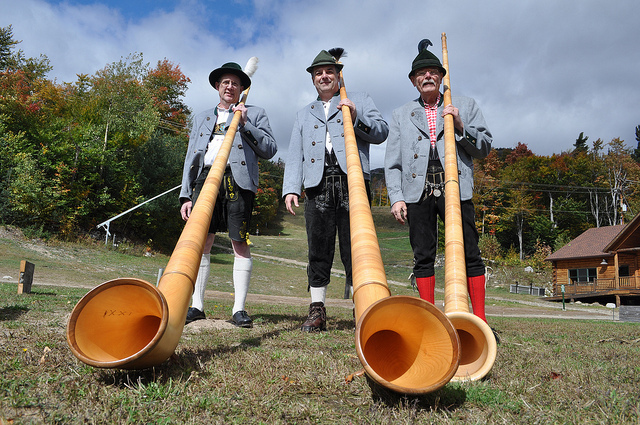 One of the highlights of entertainment at any Oktoberfest is the iconic alpenhorn. This year, The Alpen Trio will perform, keeping the alpine spirit alive in the Adirondack Mountains. Additional entertainment includes: Schachtelgebirger Musikaten performing in the Cloudspin Lounge both days, and The Alpenland Taenzer band and Herb Liebenhagen in the Base Camp Market. There’s no question you’ll be entertained in style with all the music planned for this year. This year the kids will be entertained by free carnival rides, Oktoberfest arts & crafts, face painting, and the famous Whiteface Airbag Jump. Jump tickets will cost $10 for one jump or $20 for three. If you haven’t experienced the Airbag Jump, get your brave on and give it a try. A lift raises you to your own comfortable height, from which you jump into the air bag. The lift will go as high as 30 feet. I hear tell the airbag feels like jumping into a cloud. I, unfortunately, have this height thing, so I haven’t tried it…yet, but it looks like a hoot. And, keep in mind, the airbag is not just for the kids! In addition to all the entertainment, the Whiteface Gondola will be open for rides at discounted prices all weekend. 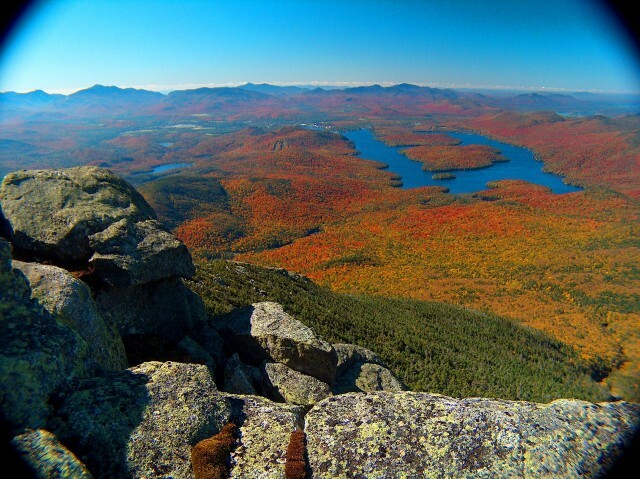 Make sure to take a trip to the summit of Little Whiteface and view the fall foliage from an amazing vantage point. In years past the Alpenhorns have played for visitors at the top - an amazing sound in the wilderness. New to Oktoberfest this year is the Lederhosen 5K running race. For an entry fee of $50 you’ll get entry to Oktoberfest, a t-shirt (for advance registrants only) and a pint glass to fill with a coupon for a beer or soda. There will also be a kids 1K Fun Run. It’s a family fun trail run and there’ll be some prizes for best costume, fastest time and most beverage left in cups. Adults will carry a cup filled with beer and the kids a cup with soda. See how much you keep from spilling on the ups and downs of the course! As in years past, there will be a free shuttle to and from the mountain for the event from both Wilmington and Lake Placid. Plan ahead with advance reservations for rooms in Wilmington this year. Browse our online hotels and lodging property list and make a reservation right from the website this year. You can also purchase festival tickets online so you won't have to stand in line. See what else is going on in the area by checking out our complete events schedule. Make all your plans and you won't have to think about a thing except having a great time. See you there!